Hamas, the Palestinian Islamist movement in control of the Gaza Strip, has burned two million painkillers used as recreational drugs by Gazans. The pills, called Tramadol, were confiscated from smugglers who bring them through tunnels across the Egyptian border. The drug, a mild opioid, is taken by many who say it relaxes them. But the drug is addictive and should only available from doctors by prescription, Hamas say. 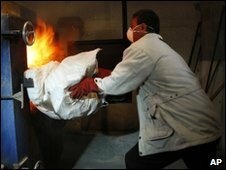 Sacks of the pills were thrown into an incinerator in Gaza's largest hospital. The United Nations in Gaza says many people are taking drugs because of the trauma and stress caused by a major military incursion by Israel last year. Doctors in Gaza have been warning for some time of a growing addiction to painkillers, the BBC's Jon Donnison in Jerusalem says. Experts say addicts experience mild flu-like symptoms on withdrawal. Gaza is under tight blockade by Egypt and Israel, tightened since the Hamas movement took control of the territory in 2007. The tunnels are a conduit for badly-needed commercial goods, including food and medicine, but are also widely believed to be used for smuggling cash and weapons to Hamas. Egypt, which helps maintain the blockade and opens its border with Gaza only occasionally, is reinforcing its Gaza border barrier with underground metal plates in an attempt to block the tunnels. The UN and a number of international humanitarian groups warned in January that the blockade was putting residents' health at risk, the UN and aid groups have warned. Israel and Egypt deny entry to all but basic humanitarian supplies, in order to prevent Gaza's Hamas rulers firing rockets at Israel, they say.